Matthew 1:18-25 - Now the birth of Jesus Christ was on this wise: When as his mother Mary was espoused to Joseph, before they came together, she was found with child of the Holy Ghost. Then Joseph her husband, being a just man, and not willing to make her a publick example, was minded to put her away privily. But while he thought on these things, behold, the angel of the Lord appeared unto him in a dream, saying, Joseph, thou son of David, fear not to take unto thee Mary thy wife: for that which is conceived in her is of the Holy Ghost. And she shall bring forth a son, and thou shalt call his name JESUS: for he shall save his people from their sins. Now all this was done, that it might be fulfilled which was spoken of the Lord by the prophet, saying, Behold, a virgin shall be with child, and shall bring forth a son, and they shall call his name Emmanuel, which being interpreted is, God with us. Then Joseph being raised from sleep did as the angel of the Lord had bidden him, and took unto him his wife: and knew her not till she had brought forth her firstborn son: and he called his name JESUS. John 1:29-35 - The next day John seeth Jesus coming unto him, and saith, Behold the Lamb of God, which taketh away the sin of the world. This is he of whom I said, After me cometh a man which is preferred before me: for he was before me. And I knew him not: but that he should be made manifest to Israel, therefore am I come baptizing with water. And John bare record, saying, I saw the Spirit descending from heaven like a dove, and it abode upon him. And I knew him not: but he that sent me to baptize with water, the same said unto me, Upon whom thou shalt see the Spirit descending, and remaining on him, the same is he which baptizeth with the Holy Ghost. And I saw, and bare record that this is the Son of God. John 1:1-17 - In the beginning was the Word, and the Word was with God, and the Word was God. The same was in the beginning with God. All things were made by him; and without him was not any thing made that was made. In him was life; and the life was the light of men. And the light shineth in darkness; and the darkness comprehended it not. There was a man sent from God, whose name was John. The same came for a witness, to bear witness of the Light, that all men through him might believe. He was not that Light, but was sent to bear witness of that Light. That was the true Light, which lighteth every man that cometh into the world. He was in the world, and the world was made by him, and the world knew him not. He came unto his own, and his own received him not. But as many as received him, to them gave he power to become the sons of God, even to them that believe on his name: which were born, not of blood, nor of the will of the flesh, nor of the will of man, but of God. And the Word was made flesh, and dwelt among us, (and we beheld his glory, the glory as of the only begotten of the Father,) full of grace and truth. John bare witness of him, and cried, saying, This was he of whom I spake, He that cometh after me is preferred before me: for he was before me. And of his fulness have all we received, and grace for grace. For the law was given by Moses, but grace and truth came by Jesus Christ. Mark 4:1 - And he began again to teach by the sea side: and there was gathered unto him a great multifude, so that he entered into a ship, and at in the sea; and the whole multitude was by the sea on the land. And he taught them many things by parables. Matthew 13:34-35 - All these things spake Jesus unto the multitude in parables; and without a parable spake he not unto them: that it might be fulfilled which was spoken by the prophet, saying, I will open my mouth in parables; I will utter things which have been kept secret from the foundation of the world. Matthew 4: 17 - From that time (after his temptation in the wilderness) Jesus began to preach, and to say Repent: for the kingdom of heaven is at hand. Luke 13:2-3 - And Jesus answering said unto them, Suppose ye that these Galileans were sinners above all the Galileans, because they suffered such things? I tell you, Nay: but, except ye repent, ye shall all likewise perish. Mark 2:17 When Jesus heard it, he saith unto them, They that are whole have no need of the physician, but they that are sick: I came not to call the righteous, but sinners to repentance. Jesus taught in Matthew 21: 28-32 - But what think ye? A certain man had two sons; and he came to the first and said, Son, go work today in my vineyard. He answered and said, I will not: but afterward he repented and went. And he came to the second and said likewise. And he answered and said, I go, sir: and went not. Whether of them twain did the will of his father? They said unto him, The first. Jesus saith unto them (the temple priests and elders), Verily I say unto you, That the publicans and the harlots go into the kingdom of God before you. For John came unto you in the way of righteousness and ye believed him not: but the publicans and the harlots believed him: and ye, when ye had seen it, repented not afterward that ye might believe him. John 3:1-3:8 There was a man of the Pharisees, named Nicodemus, a rule of the Jews: The same came to Jesus by night, and said unto him, Rabbi, we know that thou are a teacher come from God: for no man can do these miracles that thou doest, except God be with him. Jesus answered and said unto him, Verily, verily, I say unto thee, Except a man be born again he cannot see the kingdom of God. Nicodemus saith unto him, How can a man be born when he is old? can he enter the second time into his mother's womb and be born? Jesus answered Verily, verily, I say unto thee, Except a man be born of water and (of) the Spirit, he cannot enter into the kingdom of God. That which is born of the flesh is flesh; and that which is born of the Spirit is spirit. Marvel not that I said unto thee, Ye must be born again. The wind bloweth where it listeth, and thou hearest the sound thereof, but canst not tell whence it cometh, and whither it goeth: so is everyone that is born of the Spirit. Isaiah 53:5-7 - But he was wounded for our transgressions,he was bruised for our iniquities: the chastisement of our peace was upon him; and with his stripes we are healed. All we like sheep have gone astray; we have turned every one to his own way; and the Lord hath laid on him the iniquity of us all. He was oppressed, and he was afflicted, yet he opened not his mouth: he is brought as a lamb to the slaughter, and as a sheep before her shearers is dumb, so he openeth not his mouth. Then Pilate therefore took Jesus, and scourged him. And the soldiers platted a crown of thorns, and put it on his head, and they put on him a purple robe, And said, Hail, King of the Jews! and they smote him with their hands. Pilate therefore went forth again, and saith unto them, Behold, I bring him forth to you, that ye may know that I find no fault in him. Then came Jesus forth, wearing the crown of thorns, and the purple robe. And Pilate saith unto them, Behold the man! When the chief priests therefore and officers saw him, they cried out, saying, Crucify him, crucify him. Pilate saith unto them, Take ye him, and crucify him: for I find no fault in him. The Jews answered him, We have a law, and by our law he ought to die, because he made himself the Son of God. When Pilate therefore heard that saying, he was the more afraid; And went again into the judgment hall, and saith unto Jesus, Whence art thou? But Jesus gave him no answer. Then saith Pilate unto him, Speakest thou not unto me? knowest thou not that I have power to crucify thee, and have power to release thee? Jesus answered, Thou couldest have no power at all against me, except it were given thee from above: therefore he that delivered me unto thee hath the greater sin. And from thenceforth Pilate sought to release him: but the Jews cried out, saying, If thou let this man go, thou art not Caesar's friend: whosoever maketh himself a king speaketh against Caesar. When Pilate therefore heard that saying, he brought Jesus forth, and sat down in the judgment seat in a place that is called the Pavement, but in the Hebrew, Gabbatha. And it was the preparation of the passover, and about the sixth hour: and he saith unto the Jews, Behold your King! But they cried out, Away with him, away with him, crucify him. Pilate saith unto them, Shall I crucify your King? The chief priests answered, We have no king but Caesar. Then delivered he him therefore unto them to be crucified. And they took Jesus, and led him away. And he bearing his cross went forth into a place called the place of a skull, which is called in the Hebrew Golgotha: Where they crucified him, and two other with him, on either side one, and Jesus in the midst. And Pilate wrote a title, and put it on the cross. And the writing was Jesus Of Nazareth The King Of The Jews. Revelation 1:5 - And from Jesus Christ, [who is] the faithful witness, [and] the first begotten of the dead, and the prince of the kings of the earth. Unto him that loved us, and washed us from our sins in his own blood. Hebrews 9:12 - Neither by the blood of goats and calves, but by his own blood he entered in once into the holy place, having obtained eternal redemption [for us]. Matthew 26:28 - For this is my blood of the new testament, which is shed for many for the remission of sins. Matthew 28 - In the end of the sabbath, as it began to dawn toward the first day of the week, came Mary Magdalene and the other Mary to see the sepulchre. And, behold, there was a great earthquake: for the angel of the Lord descended from heaven, and came and rolled back the stone from the door, and sat upon it. His countenance was like lightning, and his raiment white as snow: and for fear of him the keepers did shake, and became as dead men. And the angel answered and said unto the women, Fear not ye: for I know that ye seek Jesus, which was crucified. He is not here: for he is risen, as he said. Come, see the place where the Lord lay. And go quickly, and tell his disciples that he is risen from the dead; and, behold, he goeth before you into Galilee; there shall ye see him: lo, I have told you. And they departed quickly from the sepulchre with fear and great joy; and did run to bring his disciples word. And as they went to tell his disciples, behold, Jesus met them, saying, All hail. And they came and held him by the feet, and worshipped him. Then said Jesus unto them, Be not afraid: go tell my brethren that they go into Galilee, and there shall they see me. Now when they were going, behold, some of the watch came into the city, and shewed unto the chief priests all the things that were done. And when they were assembled with the elders, and had taken counsel, they gave large money unto the soldiers, saying, Say ye, His disciples came by night, and stole him away while we slept. And if this come to the governor’s ears, we will persuade him, and secure you. So they took the money, and did as they were taught: and this saying is commonly reported among the Jews until this day. Then the eleven disciples went away into Galilee, into a mountain where Jesus had appointed them. And when they saw him, they worshipped him: but some doubted. And Jesus came and spake unto them, saying, All power is given unto me in heaven and in earth. Go ye therefore, and teach all nations, baptizing them in the name of the Father, and of the Son, and of the Holy Ghost: teaching them to observe all things whatsoever I have commanded you: and, lo, I am with you always, even unto the end of the world. Amen. Acts 2:22-27 - Ye men of Israel, hear these words; Jesus of Nazareth, a man approved of God among you by miracles and wonders and signs, which God did by him in the midst of you, as ye yourselves also know: Him, being delivered by the determinate counsel and foreknowledge of God, ye have taken, and by wicked hands have crucified and slain: whom God hath raised up, having loosed the pains of death: because it was not possible that he should be holden of it. For David speaketh concerning him, I foresaw the Lord always before my face, for he is on my right hand, that I should not be moved: therefore did my heart rejoice, and my tongue was glad; moreover also my flesh shall rest in hope: because thou wilt not leave my soul in hell, neither wilt thou suffer thine Holy One to see corruption. These verses explain who Jesus was and is and always will be. But there is so much more information that you need to know that I highly encourage you to begin reading your Bible every day, starting with the four Gospels, Matthew, Mark, Luke and John. Below is a link to a Statement of Faith that may be helpful to you. The video below that is a wonderful illustration of the grace of the Gospel and its power to save. At the bottom is a guideline prayer so you may know how to get born again. (You don't have to say it verbatim, just speak to God from your heart with the knowledge you've gained from these Scriptures.) Once you pray this prayer the Holy Spirit, the 3rd person of the Trinity, will come into your heart as a deposit of heaven and He will guide you throughout your Christian life. All old things pass away once you accept Christ as your Lord and Savior and you become a new creation in Christ. You don't have to do anything on your own to become this new creation, God does it by His Spirit. And then as you grow in His Word, the Bible, you will begin to feel convictions in areas of your life where God doesn't want you to act or do the old things and you will begin to learn to walk the way He wants you to. I recommend you get a King James Bible to read because the modern Bibles claim to be easier to read (because they don't have the thees and the thous) but they are actually wordier (they use more words to say simple things) than the KJV and they delete and add things the KJV does not have. 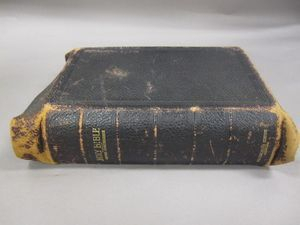 For more information on the KJV Bible versus modern Bibles please see the two links below. Pray about everything, including which Bible to read (in case you don't believe the information I've provided) and God will lead you to know the truth about the gray areas in life, And remember the devil works in the gray as well as the dark, so don't be casual about gray areas. This website is designed to shine a light on many religions, denominations and secular movements that call themselves Christian or compatible with Christianity that will take you on a long and painful ride if you don't take your walk with Christ seriously. *A good marker for knowing if you've ever had, or how to have, a true born again experience: Repentance of sins precedes accepting Jesus as Savior and repentance is the understanding that 1) you are a sinner that can never reach God's perfection standards on your own because Adam's sin caused the fall of mankind and you are, (as everyone born after Adam and Eve is), a human being born with a sin nature. As such, there is no way you can get back that initial connection Adam was given prior to the fall without the Lord Jesus being that bridge to God for you. Jesus alone is perfect enough to please God and His sacrifice alone is enough to cause God to forgive you and allow you to be His child. Nothing you can do can make you or your life perfect enough in God's eyes to allow you to be His child. He is too holy and His standard too high for any of us. And 2) you realize that you have lived a selfish life contrary to the Word of God up until this point and you want to turn from doing things your way to pleasing God now. If you do not feel any of this, and you are just saying the sinner's prayer to not go to hell, you may end up deceiving yourself into thinking you are saved when you are not. A person who prays the sinner's prayer will really want to live for God going forward so if you don't have this conviction then you will want to first get your heart right prior to going forward with the prayer below. Consider this and see if this helps you to feel not only your need for Christ but your WANT for Christ: Jesus is God so He is perfection and He died in your place, as a sinner, because He knew you would never be able to reach God's standard of perfection to get into heaven. And Jesus did this in advance of whether you accept His gift or not! I mean how many people do you know that would do something so horrible as die on a Cross for you, a slow and excruciatingly painful death, when they didn't have to? And knowing you may reject it after He suffered immensely to offer it to you?! Jesus left His perfect home in heaven to come down to this cruel world to do that for you because He knew you could not do it for yourself! That my friend, is love! Now that you have accepted Christ as your Lord and Savior, let's look at some of His key teachings to help you get started learning how Jesus and God think, which is so different than how man/woman thinks. Let's start with the Beatitudes found in all 4 Gospels, Matthew, Mark, Luke and John, but here we have it taught from Matthew chapter 5:3-48. There are some cross-reference verses listed by some of these verses in case you would like to look them up and they have been divided into categories, subject-wise, which may be helpful to you in understanding the teaching.. Please don't beat yourself up in thinking I can never measure up to such a high standard, no Christian has ever been perfect in keeping the Beatitudes, but we are to remind ourselves regularly as to what pleases God so the study of the Beatitudes is essential for our Christian walk. 10 Blessed are they which are persecuted for righteousness' sake: 1 Pet. 3.14 for theirs is the kingdom of heaven. 12 Rejoice, and be exceeding glad: for great is your reward in heaven: for so persecuted they the prophets 2 Chr. 36.16 · Acts 7.52 which were before you. 14 Ye are the light of the world. Joh. 8.12 ; 9.5 A city that is set on a hill cannot be hid. 15 Neither do men light a candle, and put it under a bushel, but on a candlestick; Mk. 4.21 · Lk. 8.16 ; 11.33 and it giveth light unto all that are in the house. 25 Agree with thine adversary quickly, while thou art in the way with him; lest at any time the adversary deliver thee to the judge, and the judge deliver thee to the officer, and thou be cast into prison. 43 ¶ Ye have heard that it hath been said, Thou shalt love thy neighbor, Lev. 19.18 and hate thine enemy. I heard this sermon that is excellent in explaining that we all need to examine ourselves to see if we are true Christians or are we false-professing Christians? I am not recommending this pastor/preacher in all of his sermons, he is a Reformed Baptist, which means he is a Calvinist, but unlike other Calvinist preachers of today, he actually preaches this message to all Christians, including those in his church, which is something most Calvinist preachers would not do since they feel anyone in their church is "elect". This preacher's name is Martin Lloyd Jones and he is deceased now so the audio is old and a little hard to hear in the beginning so turn up your speakers and sit back and listen to a very well laid out exposition of what it is to be a true believer. I believe he takes the confusion out of the matter and we need more preaching like this in the churches today! Below are two men's testimonies that will help you to understand Christianity and can help you to define your walk with God.